When it comes to being found on a search engine, page one or the first page is the most coveted position a piece of digital information can hold. For the vast majority of searches, a user rarely looks at more than the first page or first few links, so anything that falls outside that range is in danger of sinking further and further into obscurity. If you have a video, you want as many people as possible to see it, and that means you want them to find it easily. So, you’ll want to make sure a search engine decides to put you on the first page. But how do you that? We’ll explain that here. We’re going to focus on two primary ranking systems. One is the Google SERP, or Search Engine Results Page, which may feed into YouTube or other video content channels such as Vimeo or Dailymotion. The other is the more specific Video Search Results when people decide to use Google but specifically click on the “Videos” tab because they already know that’s the medium they’re interested in consuming. The Google SERP uses a variety of different metrics, conditions, and characteristics when it determines how to rank videos and which pages to put them on for final search results. Some videos are just naturally more popular than others due to the quality of content, but there’s a range of other factors in play that can affect how SERP algorithms make these decisions. Keyword planning is your foundation, and without it, people may never arrive at your video. You must know exactly which words people are most likely to type in the search bar to find content that is related to your video. If you’re making a video about Asian cuisine, but insist on using keywords like skateboarding and knitting, your video will never be seen by its intended audience. You must use relevant yet specific keywords. Once you know what keywords are most likely to be used by people searching, you must make sure that the video you produce matches the expectations set by the keyword search. Always remember that there’s a factor known as “bounce rate,” which the Google SERP is tracking. If people click on your video but then click away very quickly afterward, the algorithms take that action as an indication that your video is not matching up with the keyword and people aren’t finding what they want and so they’re leaving. A high bounce rate will lower your SERP ranking. You should do your best to make the most captivating video you can. If you’ve managed to find the right keywords, and you’ve won the viewer over by matching their search terms, then work hard to meet or exceed their expectations with the actual quality of your content. One great, tried-and-true technique is to “dangle the carrot” in front of the viewer with some question or another provocative element. Use teaser videos, thought-provoking or intriguing titles, and engaging opening sequences. Make them want to know more, or at least watch more to see what happens. If you’re just getting started, then you may want to read up on good video production. Watch other videos in the same area of interest and see what kind of photography, pacing, editing, and presentation are standard in the videos that are most popular. See if you can benefit from using similar techniques, but make sure you are interesting and distinct. A dull or unoriginal video will lose viewers. In some ways, this is similar to proper keyword planning. Take the time to come up titles that, at their best, not only meet some keyword search requirements but entice viewers at the same time. Provocative questions or statements are, just like in magazines and newspapers, effective attention grabbers. Make sure your title is relevant and in-line with popular topics but avoid misleading people and being labeled as “click bait.” Searchers want useful and appropriate content. Length is critical, but it will differ depending on which type of search platform is being used. The algorithms on YouTube specifically, for example, tend to rank videos about 10 minutes long more favorably than shorter videos. On the other hand, anyone using the Google SERP mechanism will find their rankings go up with shorter videos. In general, however, videos under three minutes tend not to rank favorably, so strive for a natural duration of 5-10 minutes. Not indexing a video can be a critical “rookie mistake.” Make sure that your video is correctly indexed in Google before you start posting it anywhere else. Google identifies ownership of a video based on where it was first published. So if you want a video to belong to you and be identifiably associated with you, then you should post it on your website, allow for some time so Google can index it, and then start embedding the video elsewhere. In the same way that a meta-description can be an essential “first line” or hook to attract people to click and continue reading through your web page, the thumbnail for your video should be carefully crafted. The image that appears with your title can make the difference between enticing a viewer to watch more or pass it over for something that looks more interesting. Optimization is all the small, but critical “housekeeping” chores you should undertake to give your video the best chance of being found and viewed. Make sure it’s in a supported format, like .mpeg or .mov. Use something like Schema.org for structured data to describe your video. Create a video sitemap, provide a video transcript for Google to better understand the content of your video and optimize the page for keywords, descriptions, tags, and anything else that can give more specificity to your video. Finally, create a new, unique page for your video, to increase its SERP compatibility, and add any links or trust signals that relate to your video and help to make it easier to find through cross-referencing. 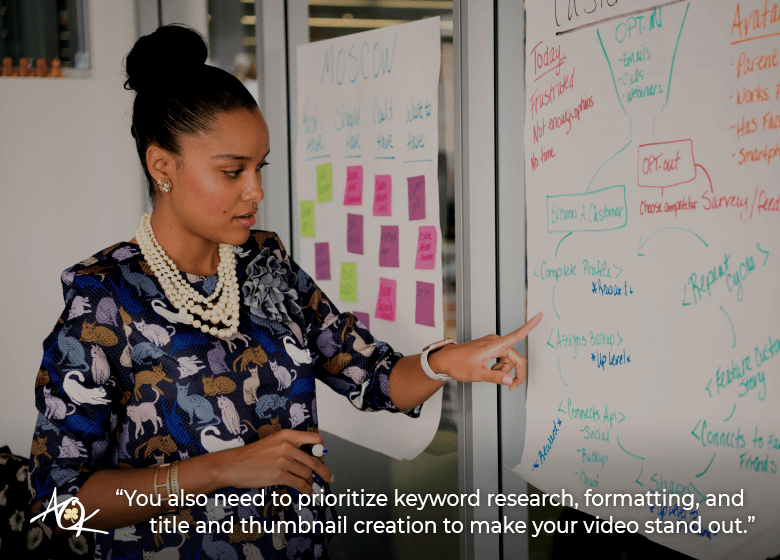 Though your goal should always be to create high-quality, thought-provoking, intelligent content, you also need to prioritize the background work like keyword research, formatting, and title and thumbnail creation to make your video stand out and rank high on the SERPs.